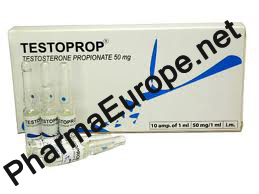 Product: Testoprop (Testosterone Propionate) 10x1ml Amps. During a typical cycle one will see action that is consistent with a Testosterone. Users sensitive to gynecomastia may therefore need to addition an antiestrogen. Those particularly troubled may find that a combination of Nolvadex and Proviron works especially well at preventing/halting this occurrence. Also unavoidable with a Testosterone are androgenic side effects like oily skin, acne, increased aggression and body/facial hair growth. Those who may have a predisposition for male pattern baldness may also find that Testosterone propionate will aggravate this condition. To help combat this we also have the option of adding Propecia®/Proscar®, which will reduce the buildup of DHT in many androgen target tissues. This will help minimize related side effects (particularly hair loss) from Testosterone propionate although it offers us no guarantees. And as with all Testosterone products, propionate will also suppress endogenous Testosterone production. The use of a Testosterone stimulating drug like HCG and/or Clomid is therefore almost a requirement in order to avoid enduring a post-cycle crash.